I am and always have been seriously in love with the neogoth trend. Yes, it probably started sometime around the angsty-teenager phase and never actually left (although I've tried to conceal it). The truth is I love leather, studs, spikes, and all that goodness when it's played down into something softer and hopefully (wishfully) classier. 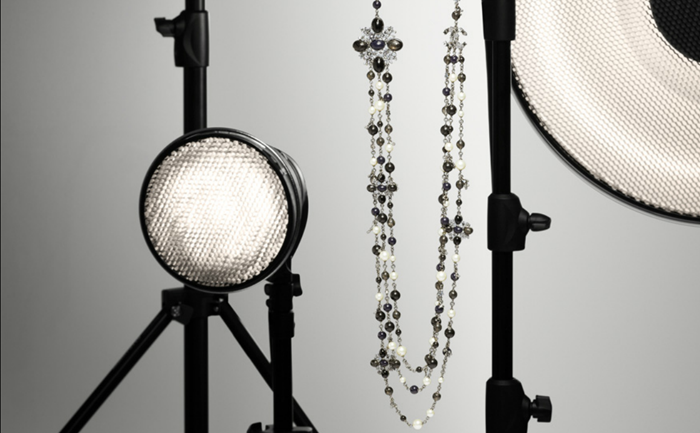 After bumming around on the internet I came across a Chanel necklace that I had a liking for because of it's close resemblance to rosary beads. I'm obsessed with Christianity in the non-religious kind of way. It's actually more of a morbid fascination. Don't ask, because I can't explain. 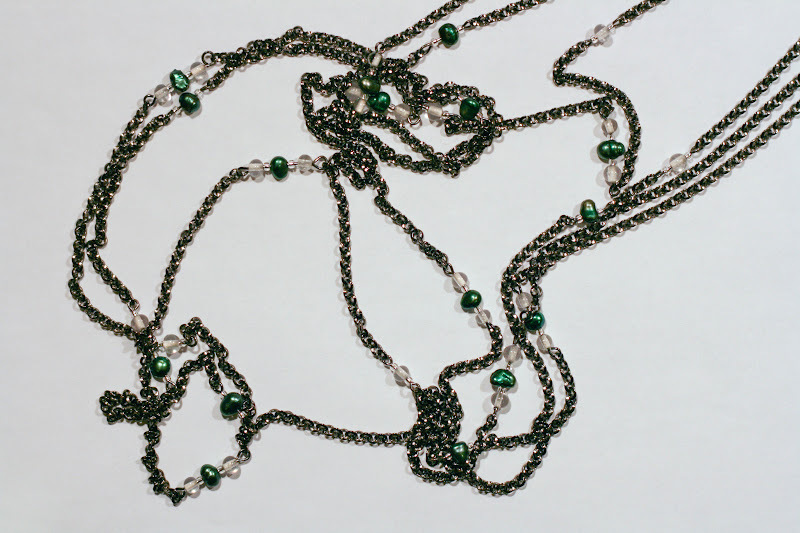 Oddly enough, just at that time I was fussing around with some emerald freshwater pearls and gunmetal chain. Obviously, I had to make a necklace. 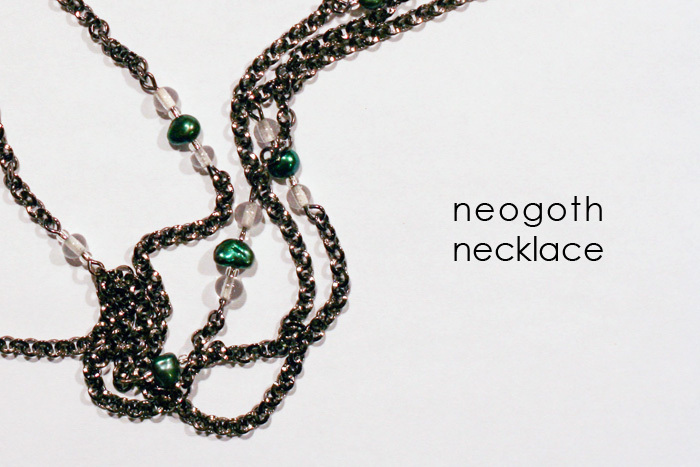 So here's my DIY softer neogoth necklace-- oddly inspired and romanticized by Chanel and freshwater pearls, and made harder by the gothic goodness of plain old gunmetal plated chain. I of course used freshwater pearls and gunmetal plated rollo chain. As for pliers, at the least you will need round nose pliers, chain nose or flat nose pliers, and side cutter pliers or some sort of way to cut the headpins. I would NOT suggest trying scissors, I have in a dire situation and it was a terrible idea. You might also like to use a clasp with some jump rings, but that's up to you. It's also up to you to make your findings and chain match or not. All of these supplies are available on artbeads.com. 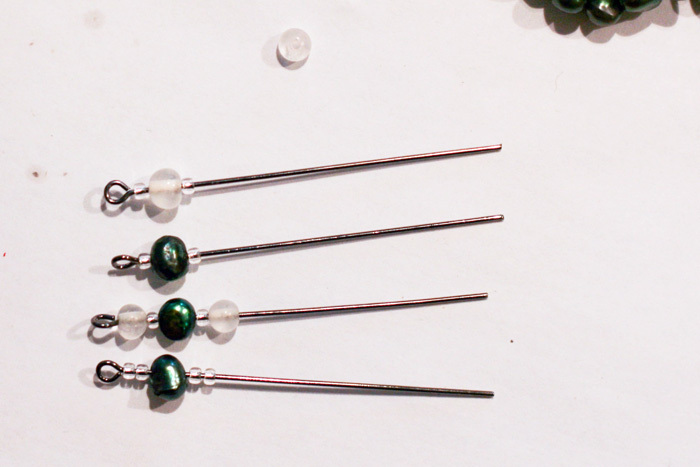 Begin by creating some bead combinations on your eye pins. I went with some basic yet small combos and ended up scratching the one on the bottom. 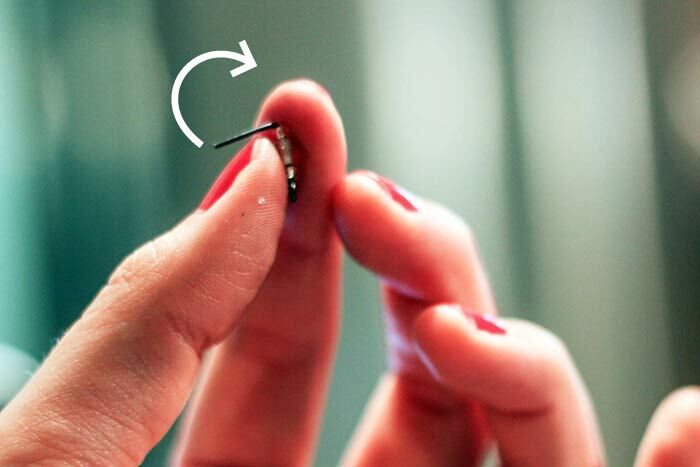 3 supporting the excess bent pin with your thumb, use C, your round nose pliers to curve the pin away from you to create an eye. See the photo below for a visual. While I am proud I somehow managed to take this photo with a fixed lens that was SO wrong for this photo (it required a lot of guesswork and holding the camera behind my head in strange contorted positions, yes, I looked like a flamingo trying to tango), I realize that you might need a video. 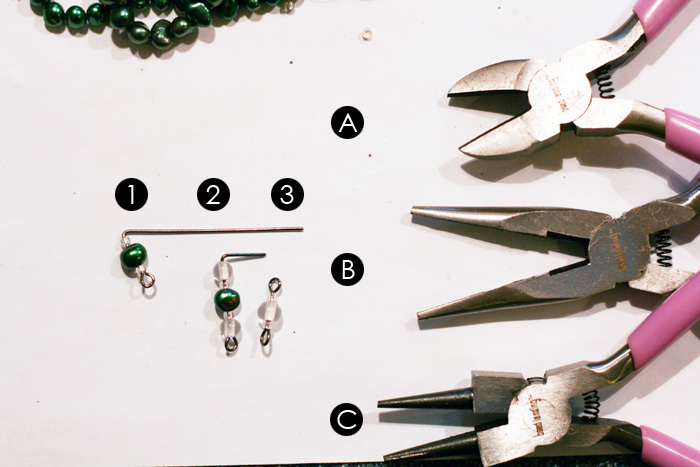 Artbeads (I'm obsessed), has a great tutorial for creating all sorts of eye pins here! Phew! That was once sentence. Some middle school English teacher just cried. Keep at the eye pin process to your hearts content. 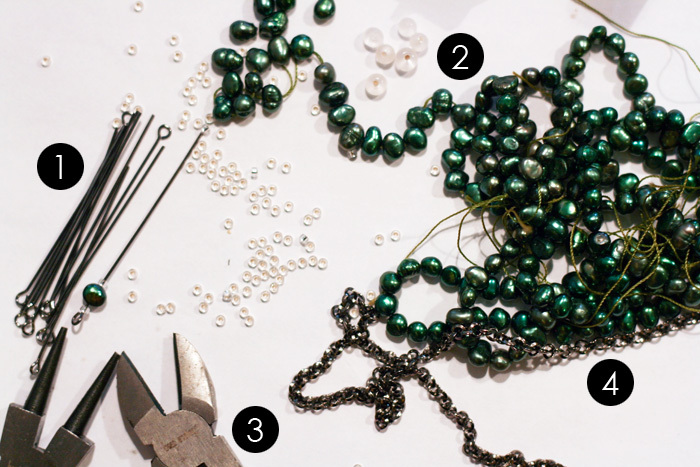 Then you can start hacking off bits of chain and attaching them with your freshly created eye pins! Get funky with lengths and attach a clasp if you desire. Voila! PS: I swear, the colors get all funky and darker when I upload my photos to picasaweb. It would drive me insane if I wasn't already.